The Broke and the Bookish : Jamie Talks About Holiday Reads! I've never been one to really read a TON of holiday books but I read maybe one every year. Lately I've been interested in them more and more but I just don't know where to start (that's where YOU are going to come in later in the comments). 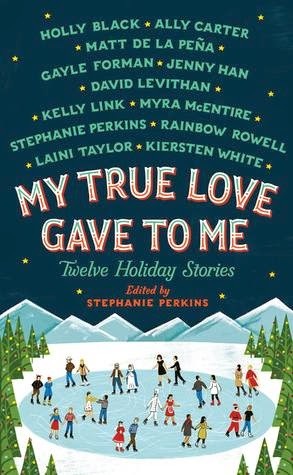 At the current moment I'm reading My True Love Gave To Me edited by Stephanie Perkins. It is SUCH a wonderful holiday collection. Some of my favorite authors have short stories in it -- Stephanie herself, Gayle Forman, David Levithan, Rainbow Rowell, Jenny Han and more! I've been reading it stretched out over the course of a few weeks and I realized it's the PERFECT read during the holidays because you can sneak in a short story here and there during the holidays. My reading feels so stilted during the holidays because I'm off to this family's house and then wrapping presents and watching Christmas movies and suddenly it feels like I'm starting and stopping abruptly in my current read. So to have a short story collection where I don't have to have a ton of time to really get IMMERSED in it is quite perfect. And it's so heart-warming and perfect. It really is. I almost wish I saved it to read DURING the holidays (next year I will read it again for sure). I just have really enjoyed doing holiday reads because they are always a little more light and less intense than my normal reads. (MOST OF THE TIME). So I'd really like some recommendations for holiday-ish books to read. There isn't much in the YA world (I've read Let It Snow and Dash & Lily) which stinks. And most of the time with adult fiction they always seem to be a holiday romance that is set within a romance series I haven't read and I never know if I will be confused/not enjoy it as much because of that. I typically read contemporary YA/adult and I like romance! I just want a really good holiday book to read so I'm trust you, dear readers, to provide me with some good recs! Hit me with links to your blog if you have roundups of good holiday reads! Do you read holiday-ish books during the holidays? Do you find it hard to find time reading during the holidays? A Newberry Christmas is my favorite collection to read around the holidays! I bought this book too! I only read holiday themed books through December, and I'm always on the lookout for good ones. I'd definitely recommend Carole Matthews and Sarah Morgan. I was also very pleasantly surprised by Katie Flynn last year, A Christmas to Remember just seemed more YA/NA than anything else. I always read Ballet Shoes by Noel Streatfeild each Christmas too. I just finished this one and absolutely loved it. You should read Let it Snow if you haven't. Four holiday stories, connected in interesting ways. Jamie, I HOPE you've read Let it Snow by John Green, Maureen Johnson, and Lauren Myracle. It's a YA 3-story anthology, but the stories are actually related and intertwined. I loved that book so much. There's also an NA novella called Snowed Over by Angie Stanton, which is amazing and probably my favorite Christmas book. Sleigh Bells in the Snow by Sarah Morgan is an adult romance, and the first in a trilogy. THIS is my favorite Christmas romance. The second book in the series is cute, but takes place during the summer. The third one, Maybe This Christmas, just came out last month and I'm starting it tonight. It's my most anticipated of the season! AND Starry Night by Debbie Macomber is amazing. It takes place in Alaska (very remote), and it's amazing. Look it up. Decked with Holly by Marni Bates is another YA one and takes pace on a cruise to Mexico! It involves a famous singer and a girl... love happens. You know. It's adorable. I just finished an NA novella called Mistletoe and Mr. Right by Lyla Payne, which takes place in Ireland. It was sweet, but not my fave ever. It's on Netgalley right now, though. If you can get your hands on The Unlikely Romance of Kate Bjorkman by Louise Plummer (out of print), it's amazing! It's a YA Christmas book, and the main girl is hilariously awkward. I really love Christmas books. Haha. One of my favourites is "Christmas on Mill Street" by Joseph Walker. One I reread each December is "Old Christmas" by Washington Irving. "Christmas at Fairacre" by Miss Read is lovely, as are Dicken's "A Christmas Carol" and "Cricket on the Hearth", Two more very nice short story books are "An Island Christmas Reader" by David Weale and "Favourite Christmas Stories from Firesaid Al" by Alan Maitland. These are the books I return to every Christmas because they are just good to miss. Hope you find something in there you can make a part of your tradition as well. I'm off for the 2 weeks of Christmas thru New Year's and I'm already stock-piling holiday books to read during that time! I'm very much feeling the Christmas spirit this year (last year sucked) so I'm ready to dive into those books! My number one favorite holiday/winter book is The Thing About Jane Spring by Sharon Krum. It's more winter, but does have Christmas in it. I adore this book so much. Jane is a tough lawyer who has a soft side that comes out one snowy evening during a Doris Day movie marathon.